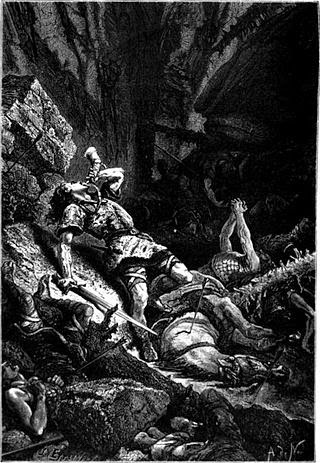 Charlemagne's rear guard was attacked by the Basques in the valley of Roncesvaux. Roland, its leader, fought a courageous fight, and, though conquered, became immortal. The heathens said, “We were born to shame. And the cry ‘Montjoie!’ their rallying shout. Javelin, barb, and plumèd shaft. Yet entrance none to his flesh they made. Roland remaineth, on foot, alone. He searcheth vale, the searcheth height. Gerard of Roussillon, the old. And laid them Turpin’s feet before. The archbishop assoiled them all, and blessed. Lord of the March unto Rivier vale. He swooned for sorrow beyond control. And his mortal anguish on him came. The archbishop, vicar of God our Lord. And a deadly foe of the infidel. God’s benediction within him dwell! Such prophet never rose as thou. His brain is oozing by either ear. And he swooned anon, for the end was nigh. On the green grass Roland hath swooned away. His face and body with blood bespread. And on Roland, body and arms, laid hold. “The nephew of Karl is overthrown! Roland returned to his sense anew. And cast him lifeless before his feet. As, right or wrong, to lay hold on me? But his Durindana all bare he held. He smote upon it ten grievous blows. Yet it brake not, nor bore its edge one dint. “Mary, Mother, be thou mine aid! I may no longer thy guardian be! What fields of battle I won with thee! Now the lordship of Carlemaine! He smote anew on the marble stair. It grated, but breach nor notch was there. Thus began he his plaint to make. Thou sparklest, flaming against the light! And he girt it, the gentle king, on me. Of England made he his own domain. For the hoary-headed Karl to hold! Lest thou in heathen hands remain. Erect it leaped to the sky again. His lamentation he inly made. What relics lie in thy pommel stored! Fragment of holy Mary’s vest. One who would never in battle swerve. The empire now of Karl the hoar! Down from his head to his heart it fell. And turned his face to the heathen horde. That the gentle count a conqueror died. In sign of penance, he raised his glove. On a knoll he lies towards the Spanish land. “In thy sight, Ò God, be my sins confessed. Angels of heaven descend him nigh. Nor yet forgets he his parting soul. And with claspèd hands he went to rest. And they bore it with them to Paradise.